In testing, the street down-pipes produced a max gain of +27 horsepower and +50 ft. lbs. of torque verified by our in house dyno. 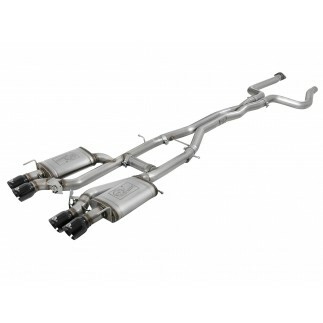 These down-pipes are designed as a "Race" version for added performance and a more aggressive sound. The down-pipes mount directly to factory mounting locations and includes hardware for a hassle-free installation. Machined, factory style flanges are used for a secure leak-free seal. These down-pipes are constructed of 2-3/4" mandrel-bent, brushed 304 stainless steel tubing for maximum performance, corrosion resistance and strength eliminating cracking. All aFe POWER turbo downpipe's are engineered and manufactured in our Corona, California facility.